I’m Rafa Martin and I’m the owner of BrassClub in Palma de Mallorca. My father has a restaurant and bar in Salamanca (where I born) and I went to hospitality school, where I discovered cocktails. I started taking part in various competitions when I was 16 years old, then moved to Mallorca to work in different hotels. I then joined The Cappuccino Group, one of the biggest restaurant and bar groups here (they are also in Madrid and Beirut) where I was in charge of all the bartenders and their training. Three years ago I decided to open my own bar, the Brassclub, because I felt Mallorca needed a more international style bar dedicated to quality cocktails. When you enter this bar and close the door, you could be anywhere… Madrid, Barcelona or the US. We make classics but also feature some signature cocktails. The team is 95% of this place and it’s thanks to them we are a success. I love this bar. It fits 65 people comfortably, plus we can seat 35 on the terrace. But, if I could have my dream bar it would have live music, so I would need a larger venue. I would also like to create a menu that pairs more elaborate tapas with cocktails, so again this would require more space for a bigger kitchen. I would definitely keep the ceiling! It was designed by my friend from Barcelona, Xavier Claramunt who is an architect and features 3420 bottles undulating in waves like the Mediterranean Sea. That’s the beauty of this bar, it gives you the feeling of being in Manhattan, but with a Mediterranean touch. 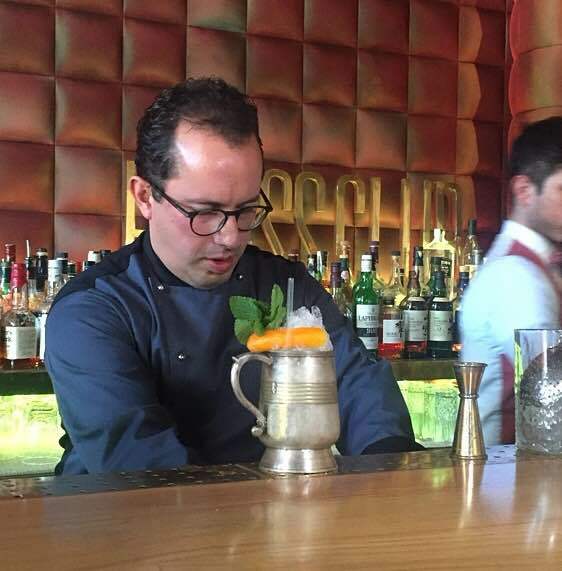 I like to go restaurants to meet chefs, because I love the combination of food and drinks and for me a lot of my inspiration for cocktails comes from food. Otherwise I want to be with my wife and just chill with a good negroni or martini. If I travel it’s different… in Madrid I like 1862 Dry Bar or in Barcelona I go to Dry Martini and Caribbean Club, which for me is the cathedral for cocktails. My favourite spirit is whisky, I love malt like Maccalan, Highland Park or japanese whiskies with a little sweetness, that are not too peaty. Because cocktails are relatively new in Spain my goal is to make people love whisky in cocktails. It’s a spirit young people see their fathers or grandfathers drink so they want the same but with a twist. For me the important thing is when my team or I think of a cocktail we have to say whoaa… that’s only 50% of the job. Then you need to make it attractive or funny and in the end it should also be related to the context. Where are you drinking it? Does it make the most of the season, by using seasonal fruits and products? For instance, two years ago our top cocktail was a gin fizz infused with figs from the fig season and when people came in December to try it, it was too late. Today you also have two kinds of people, those who like simple cocktails with a twist or the new generation who want something fun that they can feature on Instagram. The ingredient I like to use the most would be vermouth. It’s very Spanish and there is actually a quote the Spanish use: we finish our work and we go for a vermouth. It’s easy to use in cocktails like americanos and negronis, it can be sweet or more bitter and as 70% of the world’s vermouth is produced in Spain, it would be criminal not to use it. In Spain, go to Barcelona and visit the Caribbean Club, where you can see the very essence of what a bar was like 60 years ago. In London, go to Nightjar and 69 Colebrook Row, for me they are important bars.